In 1910 New York's art scene was dull and stuck in the past--lagging considerably behind Europe. Before the century reached its midpoint, however, New York would come to dominate the art world. It seemed that in a blink of an eye New York City transformed from provincial backwater to vibrant epicenter of the art world. This incredible transformation was entirely triggered by the Armory Show, the most important art exhibit in U.S. history. 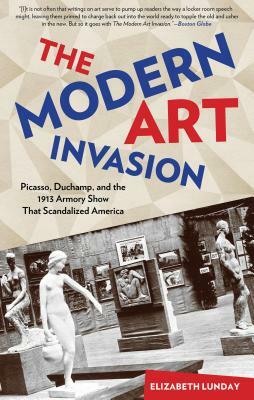 Held at Manhattan's 69th Regiment Armory in 1913, the show brought modernism to America in an unprecedented display of 1300 works by artists including Picasso, Matisse, and Duchamp, A quarter of a million Americans visited the show; most couldn't make sense of what they were seeing. Newspaper critics questioned the artists' sanity. A popular rumor held that the real creator of one abstract canvas was a donkey with its tail dipped in paint. The Armory Show went on to Boston and Chicago and its effects spread across the country. American artists embraced a new spirit of experimentation as conservative art institutions lost all influence. New modern art galleries opened to serve collectors interested in buying the most progressive works. Over time, the stage was set for American revolutionaries such as Jackson Pollock, Mark Rothko, Roy Lichtenstein, and Andy Warhol. Today, when museums of modern and contemporary art dot the nation and New York reigns as art capital of the universe, we live in a world created by the Armory Show. Elizabeth Lunday, author of the breakout hit Secret Lives of Great Artists, tells the story of the exhibition from the perspectives of organizers, contributors, viewers, and critics. Brimming with fascinating and surprising details, the book takes a fast-paced tour of life in America and Europe, peering into Gertrude Stein's famous Paris salon, sitting in at the fabulous parties of New York socialites, and elbowing through the crowds at the Armory itself. Elizabeth Lunday is the author of two popular books: Secret Lives of Great Composers and Secrets Lives of Great Artists. The Secret Lives of Great Artists has sold over 25,000 copies and been translated into eight languages. She wrote mental floss's Masterpieces column for six years, and has had stories in ScientificAmerican.com and American Archeology. Secret Lives was reviewed in newspaper from Oregon to Santa Fe to San Antonio to Cleveland. Elizabeth has appeared on PRI's national program "Here and Now" as well as local stations in Dallas, Austin and Tulsa. She lives in Fort Worth, Texas. Visit her at www.lunday.com.